- Don't forget about our meeting Tuesday night, 6 pm, in the Student Center! We will be announcing the New Coastal Activities Board Executive Board members! Check out our list of events, and don't forget to attend events sponsored by other clubs and departments on campus during the First 54! If you want to know what's going on on campus each day, just look to the left! For CAB's specific schedule, look under the "events" tab. 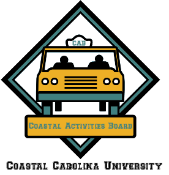 Coastal Activities Board, which is student run, provides a variety of quality entertainment and leadership opportunities to all Coastal Carolina University students. CAB's events not only help student relax, laugh, and enjoy themselves, but they also give students a break from classes and studying. CAB gives students a chance to get involved in planning events by providing opportunities to play an active role on a variety of committees throughout the year.